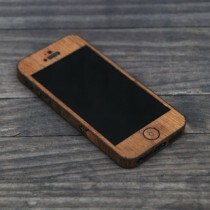 Studio eQ created our real wood iPhone wraps for the 5/5S to allow you wrap your favorite device in natural beauty. 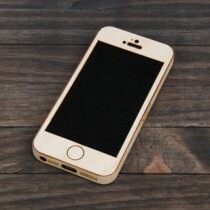 Our cases are soft and smooth to the touch and complement your phone's form factor perfectly. 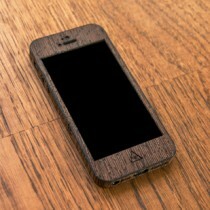 Our iPhone 4 Cases are made of ~1/32" wood panels with 3M adhesive backing. 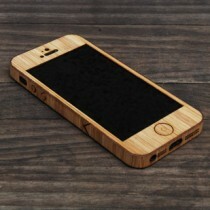 Cases currently available in birch, bamboo, teak, walnut, red oak, mahogany and zebrawood and Wenge. 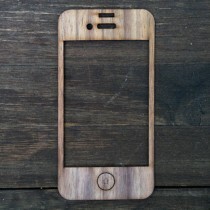 We provide a DIY kit that includes a laser-cut front and back panel along with a perfectly cut side-strip which once wrapped, creates a beautiful and sleek fitting real wood iPhone 5 case. The case is finished off with your choice of side-strip clasps including a cross, a branch, a tab, a crown or a chevron; as well as laser-cut buttons with etched details. It takes less than 5 minutes to put it on and will stay as long as you like. 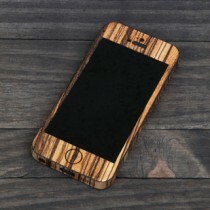 Our wood iPhone 4 cases are designed to stay adhered to your phone indefinitely, ensuring long-lasting value and a patina that matures with age. If for any reason you want to change cases or remove it from your device you can do so without causing any damage or leaving any residue. We have tested dozens of cases and our phones look no worse for the wear, all it takes is a little elbow grease. 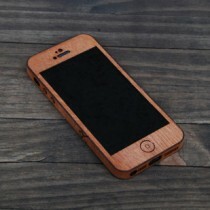 Custom cases are available and allow you to create an iPhone cover that is truly one-of-a-kind. You can use cut-outs, etches, graphics and text to build a unique case for your device that's never far from reach. We offer an optional 6 or 12-month damaged panel replacement plan for $5 or $10. When dropped, our cases absorb the impact well which protects your phone but can hurt the aesthetics of your case. By opting into the protection plan we will replace damaged panels (limit 3 case replacements or equivalent material per 6-months) if you incur any detrimental damage to your case. Great for life's little accidents and piece of mind, replacement panels ship out via USPS First Class mail. Shop online, download the template or feel free to contact us at 310.305.1734 or info@studioeqdesign.com with any questions.